The American Legion, Department of Maine is getting ready to celebrate 100 years of service to Veterans, families and our local communities. We will be conducting remembrances, commemorations, parades, open houses, and other special events all around the state. Events that support Veterans Rehabilitation, Americanism, Youth and National Security. A robust schedule of events is planned starting in March 2018 with a Birthday Kick-off, culminating on Veterans Day, 2019. We welcome businesses and other Veteran friendly organizations to partner with us as event sponsors, volunteers and attendees and be a part of our celebration. 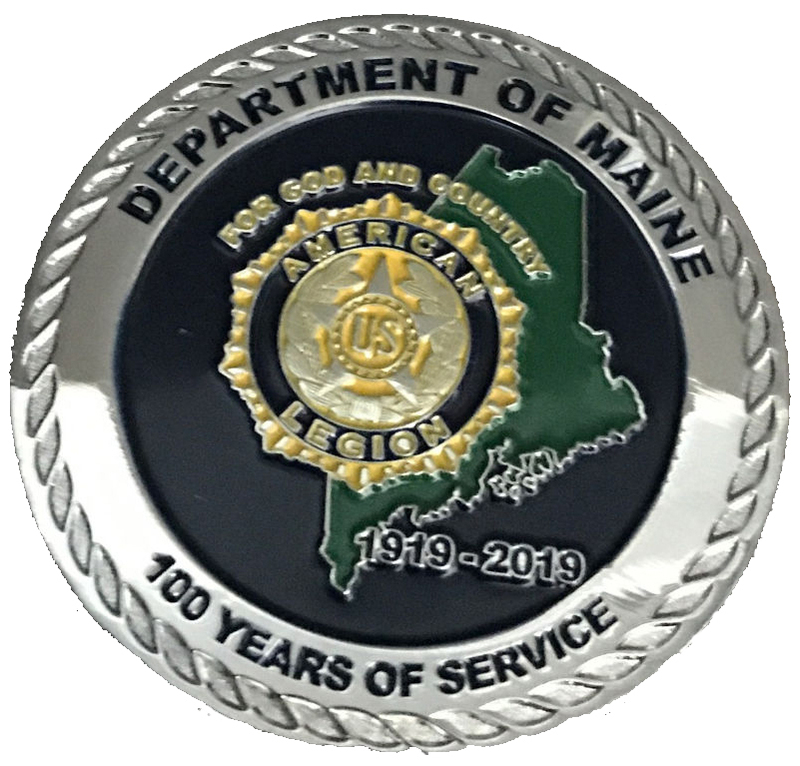 The Department of Maine released a Centennial Coin, which can be purchased online, or by calling the Department directly at 207-873-3229. The coins are $10 each plus $5 shipping/handing. To purchase your coin online, click on the Buy Maine Centennial Coin button below. Coins are also available for free pick up at $10 each. You may pick up your order at The American Legion, Department of Maine, 5 Verti Drive, Winslow, Maine 04901-0727. 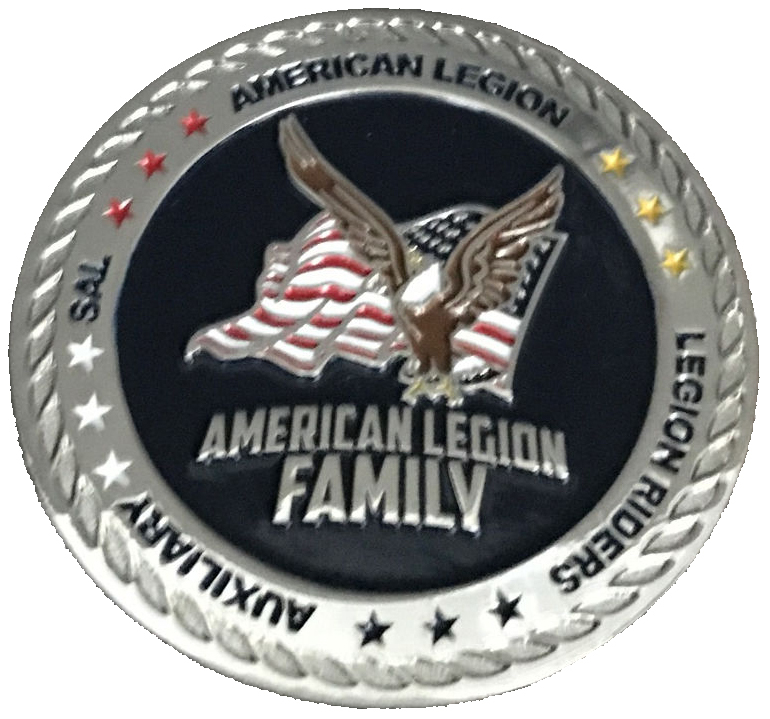 Please order your coin today while supplies last! If you write an article for a local paper, appear on radio or on television, please send us the details (Who, What, When, Where and Why) to Department at "centennial@legion.org." So we can spread the word and keep track of what is happening. When you contact the media, let them know that we have radio and television American Legion Public Service Announcement (PSA) spots and we would appreciate their support in running them. Just send us the point of contact at the station and/or network and we will contact them and arrange to have the PSAs sent! We want to spread the word that the American Legion is the LARGEST veterans organization in America and we have served America's veterans for coming on 100 years and look forward to the next 100 years!